To protect the buyer and consu mer, the industry has developed a system requiring ink-stamped grade marking of each piece of lumber under adequate quality control measures. This assures delivery of the grade specified for its intended use. Lumber grading and marking is monitored and inspected by agencies accredited by the American Lumber Standard Committee (ALSC). A valid agency grade mark on Southern Pine lumber indicates the product meets structural and appearance requirements established for that grade. 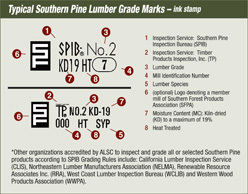 In addition, all treated Southern Pine should be identified with an inspection agency quality mark (either plastic end tag or ink stamp) conforming to building code standards. For the quality mark to be valid after treatment, the lumber must adhere to the grade requirements and the moisture content of the grade represented by the mark. Click here to download a LARGER image of these marks. 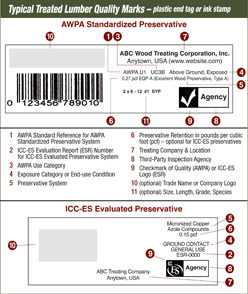 It is recommended that the buyer specify pressure-treated wood bearing ink-stamped quality marks and/or plastic end tags denoting the material was produced under supervision of an independent inspection agency accredited by the ALSC. Use of such marks by the producer provides assurance that the preservative retention and penetration complies with AWPA and/or Building Code specifications, and that the preservative used is EPA-approved and treated in compliance with federal law. Use of treated wood that does not bear an approved agency quality mark will not meet requirements of the International Code Council (ICC).